Energy prices rose again this week. For this seven-day report period the average 12-month price for natural gas on the NYMEX rose 4.7% and the 12-month average price for peak power on the PJM rose 2.1%. 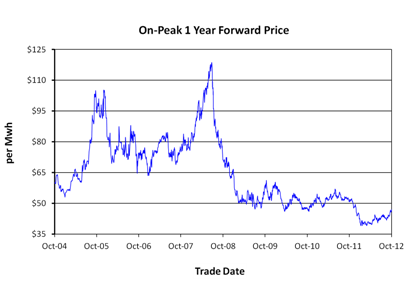 From September 7 to October 11, 2012 natural gas prices have risen 17.4% and electricity prices have risen 8.1%. Weather is the fundamental variable that appears to get credit for this week's price spike. According to BENTEK Energy, natural gas consumption this week was 5.9% higher than the previous week. This increased demand was primarily attributed to the fact that people were turning on their space heaters this week. As energy demand rises, energy prices tend to follow. Who uses natural gas for space heating? According to the U.S. Energy Information Administration, "natural gas is the most widely used source for household space heating, with 58.3 million homes relying on natural gas heating, while 43.8 million homes heat with electricity, 7.2 million heating with oil, 5.7 million with propane, and 2.5 million with wood. " For now, the market is focused on the fact that winter demand is on the way. However, it will be interesting to see what happens next week as the six-to-10-day forecast calls for warmer-than-normal temperatures in the northeastern United States. 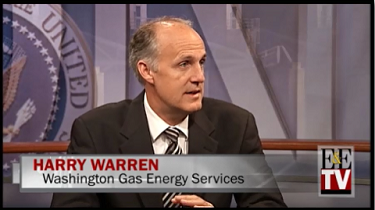 During a recent interview, Harry Warren, president of Washington Gas Energy Services, explained why businesses continue to have incentives to invest in renewables, despite low natural gas prices and a growing gas market. Working gas in storage for the week ending October 5, 2012 was 3,725 Bcf. Storage Update: We only have three weeks left in the traditional injection season and it does not appear that we will max out storage capacity. It looks like we will end the storage season with approximately 4,000 Bcf in storage. Throughout the summer months, the injections were well below average. Even though the past four injections were much closer to normal, they were still below the five-year averages. This week's injection of 72 Bcf was below expectations. Last year at this time we saw an injection of 108 Bcf. The five-year average injection for this week was 84 Bcf. Thus, the natural gas storage surplus, on a year-to-year basis, shrank from 8% above last year's levels to 6.8%. The natural gas storage surplus over the five-year average shrank from 8.3% to 7.8%. Since May 3, 2012, the gas surplus has now shrunk from 55% above the five-year average to only 6.8% above the five-year average. However, the good news is that the natural gas storage fields are above the five-year average and will be close to full by November 1, which is the start of the traditional winter heating season. Active U.S. gas rig count released by Baker Hughes for the week ending October 5, 2012 was 437 rigs. Weekly Drilling Rig Update: The active U.S. gas rotary rig count released by Baker and Hughes for the week ending October 5, 2012 was 437 rigs. This was an increase of two rigs from the previous week. The count is 498 rigs lower than the count reported this same week last year. We are 58% below the five-year average gas rig count of 1,037.